It’s been a while since I’ve done a home DIY post so you’re in luck! 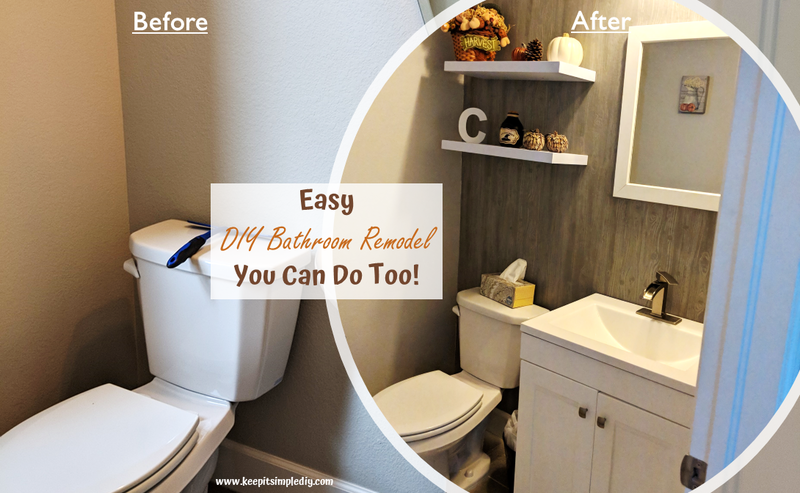 This was a pretty easy and inexpensive remodel to give our powder bathroom a whole new look! In this bathroom remodel, we switched out the vanity, faucet, and mirror. We also added wallpaper, floating shelves, and a valance. Shortly after moving into our new house, we realized there was no storage room in the bathroom for cleaning or other supplies because we had a pedestal sink. Oddly enough, our old house had the same set up but it never crossed our minds to switch it out. This house also has a bit more of a rustic feel and everything is square or rectangular. The oval sink and mirror just didn’t fit in. So, we decided to switch them out! We shut off the water to the sink. We unhooked the water from the faucet and removed the pedestal sink. We applied the adhesive wallpaper. And yes, we have textured walls. There has not been any problems with the wallpaper peeling off or staying on the wall. At this point, it has been up for about 6 months. We installed the new sink and faucet and hooked up the water. We added a valance that I made from an old extra curtain and a 2×4. And there it is! The completed bathroom remodel done under $500! We had tried to use the same faucet we previously had but it wouldn’t fit with the new sink. So, unfortunately we had to spend extra on that. Otherwise this project would have been super inexpensive!